Turkey’s flag carrier, Turkish Airlines is going to add six 777- 300ERs and 20 Next-Generation 737-800s to its fleet this year. Boeing [NYSE: BA] is set to deliver a record number of airplanes this year to Turkey’s flag carrier, Turkish Airlines. In total, the carrier will take delivery of six 777-300ERs and 20 Next-Generation 737-800s in 2016. 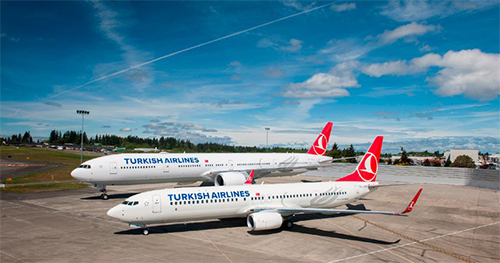 “Turkish Airlines is one of the world’s ascendant airlines and an established global network carrier. It has achieved this through various significant investments in its fleet which now stands at over 311 and growing,” said Ahmet Bolat, Chief Investment and Technology Officer, Turkish Airlines. “The delivery of a further 26 Boeing aircraft this year, which form a substantial part of our long-haul and short-haul fleets, are integral to Turkish’s continued growth and we look forward to introducing the new planes on our domestic and international network.” The Next-Generation 737’s market success has been confirmed by investors who consistently rank it as the most preferred single-aisle airplane due to its wide market base, superior efficiency and lowest operating costs in its class. To date, more than 7,000 Next-Generation 737s have been ordered by the world’s leading airlines. “We are pleased that Turkish Airlines continues to show faith in Boeing’s products and services,” said Monty Oliver, vice president, European Sales, Boeing Commercial Airplanes. “We have a strong relationship with the airline and are honored that we continue to play a key part in supporting its ambitious growth plans.” Turkish Airlines and Boeing share a long history that goes back to 1945, with the arrival of the airline’s first DC-3/C-47 airliners. Turkish Airlines entered the jet age in the late 1960s, when the airline began operating DC-9, DC-10 and Boeing 707 airplanes. Over the years, Turkish carriers have also flown the Boeing 727, 757, MD-80 and the most modern 737 and 777 airplanes. Turkish Technic, a prominent subsidiary of the airline, is a world-class maintenance center for Boeing 737 airplanes, with certifications from regulatory authorities throughout the region and beyond.